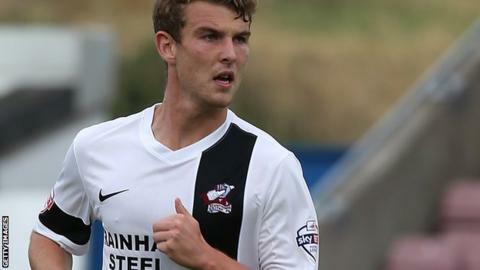 Scunthorpe extended their unbeaten run to 25 games with a narrow win over League Two's bottom club Torquay. Sam Winnall scored the only goal from the penalty spot after Lee Mansell brought down Matt Sparrow. Substitute Jayden Stockley was sent off for Torquay late on for an apparent elbow on David Mirfin. The Iron remain second in the table, level on points with leaders Rochdale. "At this stage of the season it's just about results - we showed a different side to us today. "For whatever reason it didn't happen for us in the first half, Torquay were up and at us, but the main thing again is another clean sheet and another three points. "Football can change, so we've got to make sure we stay focussed and calm. "I'm sure there'll be a big celebration if we achieve promotion - until then, we've achieved nothing." Match ends, Torquay United 0, Scunthorpe United 1. Second Half ends, Torquay United 0, Scunthorpe United 1. Jayden Stockley (Torquay United) is shown the red card for fighting. Foul by Jayden Stockley (Torquay United). David Mirfin (Scunthorpe United) wins a free kick in the attacking half. Attempt missed. Billy Bodin (Torquay United) right footed shot from outside the box is too high from a direct free kick. Damon Lathrope (Torquay United) wins a free kick in the defensive half. Substitution, Torquay United. Ashley Yeoman replaces Shaquile Coulthirst. Attempt missed. Paddy Madden (Scunthorpe United) right footed shot from the right side of the box is close, but misses to the right. Attempt missed. Billy Bodin (Torquay United) right footed shot from outside the box misses to the right. Elliot Benyon (Torquay United) is shown the yellow card. Terry Hawkridge (Scunthorpe United) wins a free kick in the attacking half. Lee Mansell (Torquay United) wins a free kick in the attacking half. Foul by Sam Winnall (Scunthorpe United). Foul by Billy Bodin (Torquay United). Eddie Nolan (Scunthorpe United) wins a free kick in the defensive half. Corner, Torquay United. Conceded by Sam Slocombe. Attempt saved. Jayden Stockley (Torquay United) right footed shot from outside the box is saved in the top left corner. Billy Bodin (Torquay United) wins a free kick in the defensive half. Substitution, Scunthorpe United. Terry Hawkridge replaces Paul Hayes. Shaquile Coulthirst (Torquay United) wins a free kick in the defensive half. Foul by David Syers (Scunthorpe United). Substitution, Torquay United. Jayden Stockley replaces Courtney Cameron. Substitution, Torquay United. Elliot Benyon replaces Karl Hawley because of an injury. Delay in match Karl Hawley (Torquay United) because of an injury. Attempt saved. Hakeeb Adelakun (Scunthorpe United) right footed shot from outside the box is saved in the bottom left corner. Delay in match Matthew Sparrow (Scunthorpe United) because of an injury. Corner, Torquay United. Conceded by Marcus Williams.